With the ink drying on a whole batch of new contracts, ABC has officially green-lit a second season of The Conners, Variety reports. It’s been five months since the family sitcom, a Hail Mary spin-off of the revived series starring Roseanne Barr, premiered but it was probably never in any real danger of not getting renewed. The Conners is the network’s highest-rated program, after all, rising from the ashes after the Roseanne revival was canceled because Barr went on a racist Twitter rant last year. As we noted in our review of the season-one premiere, The Conners was the show that Roseanne, in its 10th season, should have been—warm, but biting, with a lovably dysfunctional family at its core. 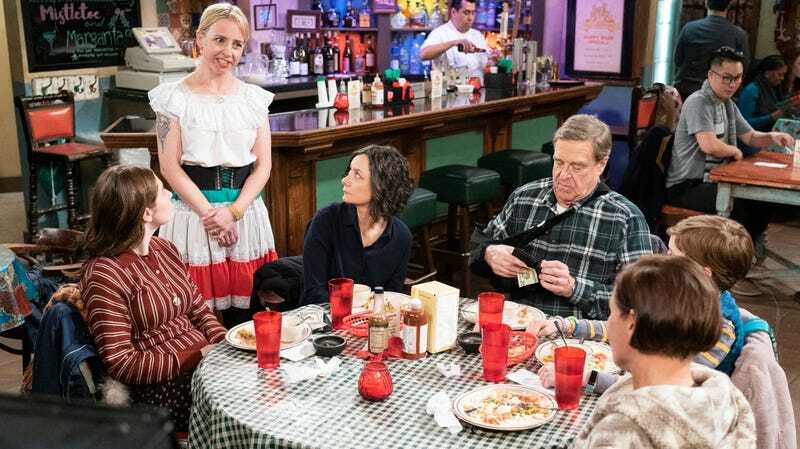 According to Variety, The Conners stars Sara Gilbert, John Goodman, Sara Gilbert, Laurie Metcalf, Lecy Goranson, and Ames McNamara will all gather around the kitchen table for more working-class adventures; several of them also signed new deals with ABC this week. There’s no word on when season two will premiere, but ABC plans to announce new cast additions soon. Roseanne calls her character&apos;s The Conners demise "grim and morbid"